Have you ever met people when you speak to them about food it feels like watching BBC Food. Paul is that kind of guy – he has an immense passion for great food, Joburg and the people of Linden. He calls 9th street his home and talks with love about this awesome suburb, The Whippet calls home. Paul started Pauli’s Food Company a few months ago, and specialises in making a range of sauces and preserves. We thought it fitting to also support Paul, another small entrepreneur, by including his preserves in our menu (especially our tapas) and by selling his products in store. 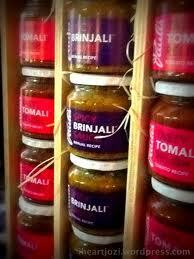 We will be stocking his famous Brinjali, a spicy brinjal sauce, that compliments any cheese platter. We invite you to come and try another proud product from the suburb of Linden, and looking at all the reviews Paul has received in the main newspapers, I am sure we have another Lindenite that is going to make us proud! The Whippet is committed to supporting local and small entrepreneurs (like ourselves) wherever we can. Yay! I tried Pauli’s stuff a few weeks ago and was BLOWN. AWAY.